At the Jeffrey M. Verdon Law Group, we successfully protect the legacies successful business owners. 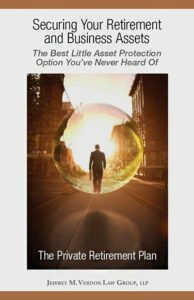 For more than 30 years, Mr. Verdon and his associates have successfully advised corporate clients on asset protection methods that are tailored to their unique financial pictures. The firm's forward-looking recommendations address every potential problem on the horizon, including threats of claims and litigation, mortgage and debt obligations, professional and product liability, and any other major risk encountered in the course of running a business.